With this in mind, we will be looking at various aspects of how to control fluid flows in our Go with the Flow series of blogs, this first blog is looking at how to Isolate the flow. A simple ball valve used to isolate the pipeline. Its main feature is the use of encapsulated seals, which deter product from forming behind the ball and thus offering a barrier and not a bug trap. In addition, it can be easily cleaned. Valves Online / Hygienic Select, can offer ball valves with a wide range of sanitary end connections, in many sizes and suitable for various applications within the hygienic industry. The valve can be easily actuated and is full bore. The two main types offered are the Mars Ball Valve in stainless steel, 3-piece body with FDA approved PTFE seats, the ball valve is suitable for SIP and CIP cleaning. Or the Inoxpa Hygienic Ball valve again with FDA approved soft seats. Operators are easily configurable including actuation and manual operation with feedback and control options. Sanitary butterfly valves, are commonly used in most liquid product applications in the food processing, beverage, pharmaceutical and chemical industries. A very useful valve offered with various end connections to suit most hygienic pipe standards from weld end, to clamp, threaded connections to suit BS4825, ASME BPE, RJT, DIN and SMS among others. Sizes are offered up to 6” (ball valves tend to stop at 4”). In addition, the valve works equally well for both manual and automatic operation. With regards to actuation, this valve has undergone major developments especially with the control top which fits onto the pneumatic actuator. The standard unit houses a solenoid valve (24VDC) and micro switch, for remote indication which are all protected inside this IP66 housing. In addition, there is a beacon fitted in this housing which illuminates when the valve is operated giving an optical indication of an open or closed position. Aesthetically pleasing this valve provides reliability and looks. Spares are readily available and for more information look up the 4800 range. 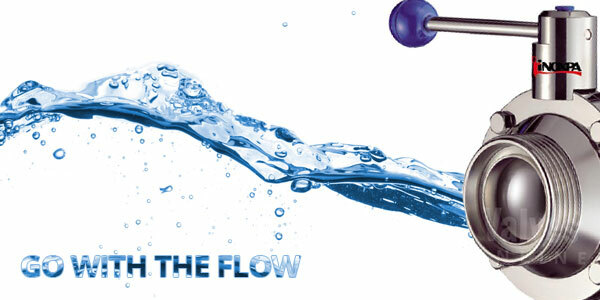 Our next blog in this Go with the Flow series will be looking at controlling the flow in hygienic environments.